With our 40th Anniversary just around the corner, we have decided to take the next few weeks to introduce members of our Team here at Duvall Catering & Events. 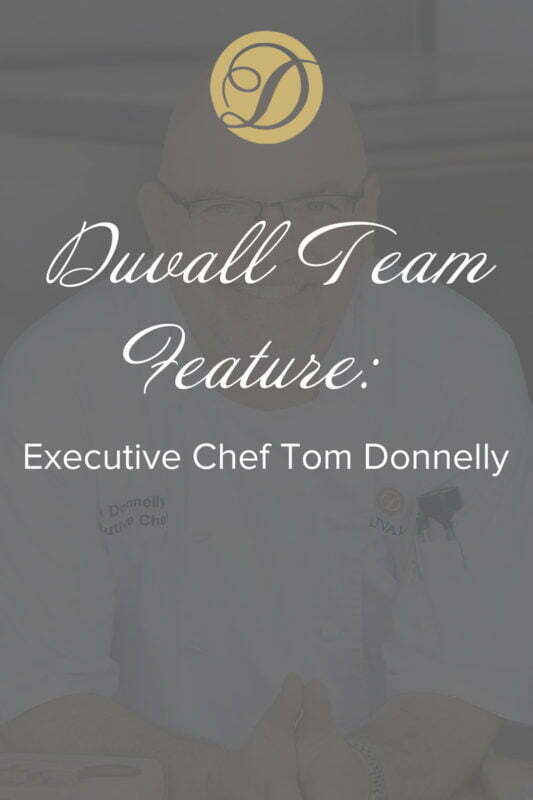 We’re starting our Duvall Team Features with members of our Culinary Team, as they are leading the charge into our next 40 years with locally sourced, creative, customized dishes as the centerpiece of any event. Executive Chef Tom Donnelly knew at fifteen what he wanted to do and graduated from the Culinary Institute of America less than seven years later. He started his formal chef career in catering with Abigail Kirsch Catering and Thomas Preti Caterers. He gained experience in the restaurant industry with One if By Land, Two if By Sea in New York and a later in California at Le Mouton Noir in Saratoga, 3 Fish in Menlo Park and Foreign Cinema in San Francisco. While in California, he joined Pan Pacific Hotel, where he traded recipes and techniques during a hotel residency in Nagoya Japan. Chef Tom returned to Abigail Kirsch Catering at Pier 60 and Lighthouse in Manhattan, followed by the Intercontinental Hotel, serving in the task force for hotel openings in San Francisco and Phoenix. Next, he took a culinary holistic path at O2 Living in Cross River using “Living Foods” to promote healthy food choices and a focus on macrobiotic, organic, local, sustainable products for the formulation of a private-label raw juice cleanse regimen. His return to catering earned him a 2016 Best Wedding Caterer Award at East Meets West Catering in Boston before coming home to bring all of that experience together as Executive Chef for Duvall Catering & Events in Charleston, South Carolina.